Overview ARDS is an acute, diffuse, inflammatory lung injury that leads to increased pulmonary vascular permeability, increased lung weight, and a loss of aerated tissue. Clinical hallmarks of ARDS are hypoxemia and bilateral radiographic opacities, while the pathological hallmark is diffuse alveolar damage. Remember Clinical hallmarks of ARDS are hypoxemia and bilateral radiographic opacities, while the pathological hallmark is diffuse alveolar damage. Most patients who survive this initial course begin to exhibit better oxygenation and decreasing alveolar infiltrates over the next several days. 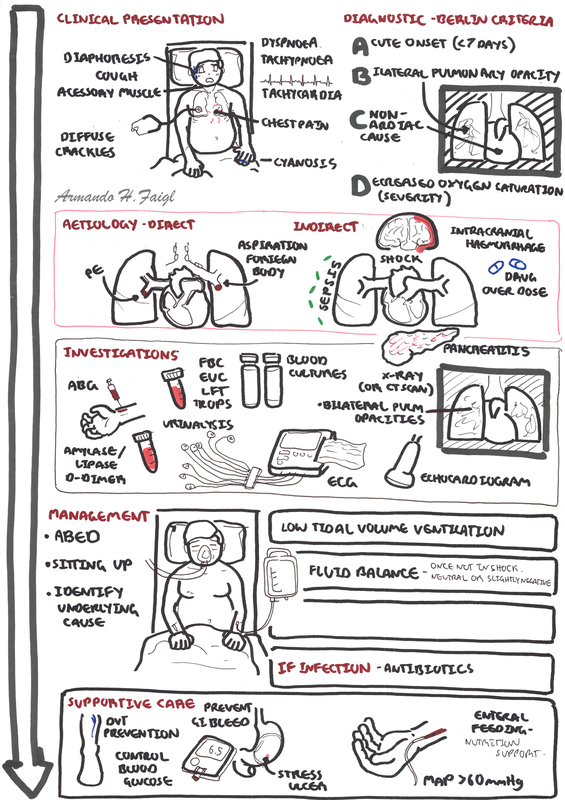 Some patients, however, have persistent, severe hypoxemia and remain ventilator-dependent. Pulmonary proliferative changes and fibrosis may progressively replace the pathological findings of diffuse alveolar damage as early as ten days after the onset of the respiratory failure.